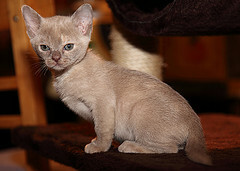 The CFA accepts the European Burmese cat in ten colors. When the Burmese cat was first introduced to the UK, Breeders crossed it with the Siamese cats there. In the UK, Siamese come in many colors including red points, so the introduction of this red gene to the existing four Burmese colors (brown, chocolate, blue and lilac) created the colors red, cream, brown-tortie, chocolate-tortie, blue-tortie and lilac-tortie. A Short, fine, close-lying, glossy and satin-like coat is typical of the Euro-Burmese. Almost as easy to care for as they are to love, the European Burmese cat is happy to be brushed. Other than an occasional bath, that is all that is required to keep this lovely feline looking gorgeous. Euro-Burmese cats are extremely intelligent, loving and loyal. In almost all kinds of households they make wonderful pets. Gregarious by nature, they enjoy the companionship of other animals, hardly ever getting into conflicts with even the most robust of playmates. However, if the friendship of other pets is not possible, they can live quite happily as the “only child”. They love humans and can be wonderful companions. The European Burmese is a sweet tempered cat with soft, smooth fur and softly rounded contours. According to the CFA, the eyes should have a top line that is slightly curved with a slant towards the nose. The lower line should be rounded. This elegant but hardy cat is of medium size, solidly built, muscular without being bulky and has very striking eyes that it uses to communicate as much as it’s voice. These are fun loving and loyal creatures. European Burmese prefer to live with other animals, and will happily play with dogs and cats alike. If need be, this breed can live in a situation where it’s the only pet, but will need plenty of love and interaction from his humans in that case. European Burmese cats are loveable, loyal and very happy to accompany their human anywhere. Their intelligence allows them to be easily trained, including harness and leash training. This cat is happiest when living in a house full of other animals and lots of activity.